Description: This black and white studio portrait measures approximately 10 inches by 7 inches. It was taken at the Avlon Studio in Schenectady, New York. It shows George W. Gillette in his captain’s uniform. History: In the 1998, Hugh MacRae, II donated a set of photographs of his stepfather, Colonel George W. Gillette, to the Museum. George W. Gillette and MacRae’s mother, Marguerite Bellamy MacRae Gillette, were both widowed in the 1940s, and later married each other. 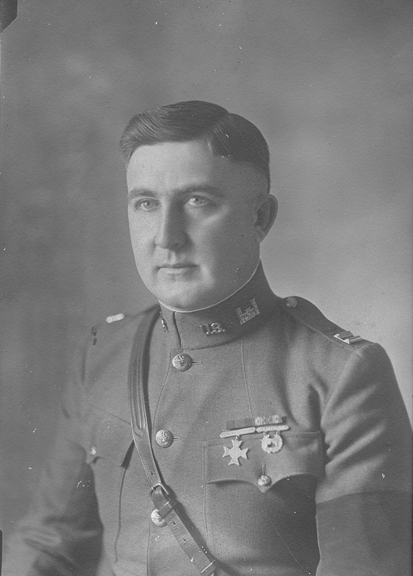 Colonel Gillette was born in 1888 and died in 1971. Gillette was born in Onslow County, t William Isaac Gillette and Rena Winbury Gillter. He moved to Wilmington as a teen, graduated from N.C. State in 1911. Gillette served in the Mexican Border Campaign of 1916, World War I, and World War II. He was commander of Company A of the 30th “Old Hickory” division in World War I. Gillette married his first wife, Pearl Marine Gillette (1891-1945) around the time he graduated from college. The couple had three children, George W., R. Pearl, and Douglas. Gillette served in the Army Corps of Engineers in around the nation, He spent some time in Wilmington, where he worked on the development of the Intracoastal Waterway. He was also stationed at Fort Logan in Colorado, and in Hawaaii. He retired from the army to take the helm of the North Carolina State Ports Authority in 1947. Gillette was the authority’s first executive director and held that position until he retired in 1954. After retirement, he consulted with many organizations, including the World Bank and the United Nations.